Monk Moses: "The Mother of God's Fifteen Days of August Has Arrived"
Saint Gregory Palamas, Archbishop of Thessaloniki, a great theologian, saw the Panagia in a vision and wrote: With what human words can we describe your God-illumined beauty, Virgin Mother of God? Your grace is impossible to be identified with either words or thoughts. Only her divine vision gives brilliance, joy and exultation. The beauty of her face comes from her beautiful soul and pure heart. It's as light poured from the inside out giving it unparalleled decency, all-good beauty. The beauty, coming from her purity, modesty and humility, caught the eye of God on her and made her the Mother of God and of the people. 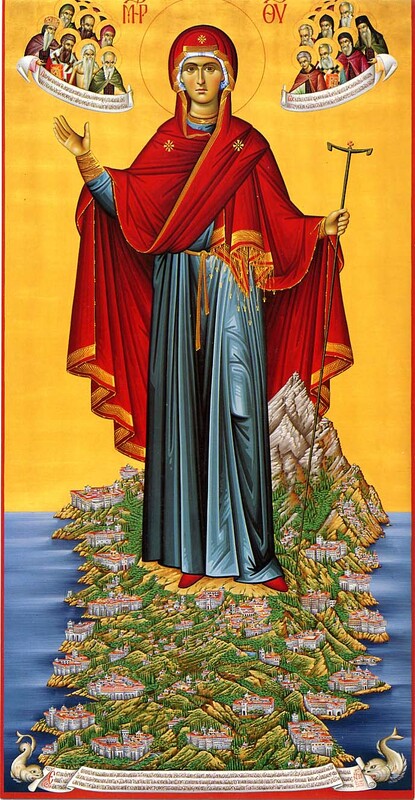 The God-bearer Saint Nikodemos the Hagiorite urges everyone to embrace the mindset of the holy Mother of God. Let us spruce our hearts appropriately in order for the virtues of the Panagia to reside within us, so that by seeing them on us we will receive rich spiritual graces and heavenly goods. The Mother of God's fifteen days of August has arrived. The year so far has given us death in Japan, Syria, Egypt, Libya, Cyprus, Norway and elsewhere. Everyday we receive calls and letters for us to remember in prayer the critically ill patients and the dead from heart problems, cancer, and from various incurable diseases, and to light a candle to the All-Holy Virgin. The Panagia hurt a lot and knows well how to co-suffer, to reach out and to comfort. On the warm evenings of beautiful August, the supplications are as a balm caressing pained hearts and make us feel exquisite pleasure like sweet dew. The miracles of multiple icons, with sleepless vigil lamps, unquenchable candles from beeswax, myriad offerings, ornate silver decorations, the repentance, the tears, the greetings, the vows, the promises, the supplications and the thanksgivings. Many fast, confess and commune. The sacred and beautiful face of the Theotokos seduces. It makes you want to place on her your heaviness, your pain, your bitter thoughts, your moods, your fatigue, and the sigh of your unhappiness. Greece, Cyprus, and all Orthodoxy are full of churches, monasteries, hermitages, and shrines dedicated to her. There are pilgrims by the thousands. Mount Athos, her wonderful garden, has numerous hymns to the Economissa, the Paramythia, the Portaitissa, the Tricherousa, the Akathist, the Terrible Protection, the Sweet-kissing, the Gorgoepikoos, the Myrovlytissa, the Galaktotrophousa, the Axion Esti. The Sacred Church of Protaton celebrates the Dormition, as well as many cells of the Monastery of Iviron. The Mother of God is the speedy helper of the Holy Mountain and it rejoices. The Mother of God is the protectress of Greece and it rejoices. She who is the most beautiful in the face and heart, the most all-pure, the one more honorable than the Cherubim Panagia, is above all the saints. There was never a more holy person, a more good woman. Her jewelry is her purity, her modesty, her humility, her silence. She taught well by her example, with her virtuous life. Our times have need of inspirational and instructive personalities. Talkativeness, insolence, shamelessness, high-mindedness, ugliness, filth, and opacity have become very tired. We all thirst for openness, honesty, shame, silence, seriousness, purity, genuine humility. The current fifteen days of August lead us in contemplation, in a meeting with the Theotokos, in the revitalization of nested virtues, with the embrace of her icon, by listening to her life, and by singing the beautiful chants of her Supplication Canon.